Five students of Sultan Agung Islamic University (UNISUULA) have succeeded in presenting a bronze medal to represent their region in the Central Java Provincial Sports Week (Porprov) which took place in Surakarta, October 19-25, 2018. The five students namely Muhammad Fabilah, Putri Amanda, Alfi Maslahatin, and Alfi Umniyyatin representing Semarang City and Dheanita Setyanti Pratiwi representing Surakarta City competed in Tarung Derajat in various classes and categories that were contested. 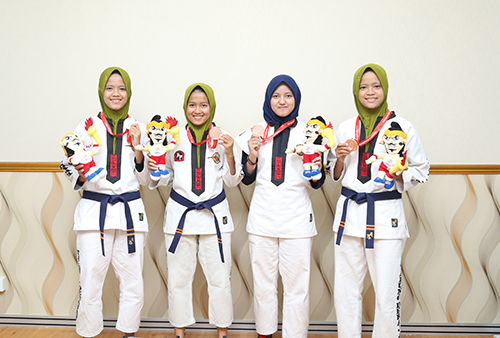 According to Putri Amanda, the achievement was due to hard work and training at the UKM (Students Activity Unit) of Boxer Unissula. “Alhamdulillah, thanks to hard work and diligent practice, I finally won a medal, even though I couldn’t get a gold medal. 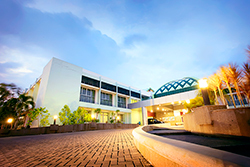 Hopefully in the future, we can give the best,” said the Faculty of Psychology student. Meanwhile, Dheanita Setyani Pratiwi added that the UKM Boxer for Tarung Derajat team aims to qualify for the National Student Sports Week (POMNAS) which will be held in 2019. Vice Rector III Muhamam Qomaruddin MSc PhD appreciated the achievement and was expected to be able to be upgraded to the next level. “We really appreciate the achievements obtained by all of those students, we will continue to support the student activity units to be able to continue to achieve a great success,” he said while accepting the presence from these athletes (11/2). In that event, the UKM Boxer of Unissula delegated eight athletes for Tarung Derajat representing two regions, i.e., five students representing Semarang City and three students representing Surakarta City.